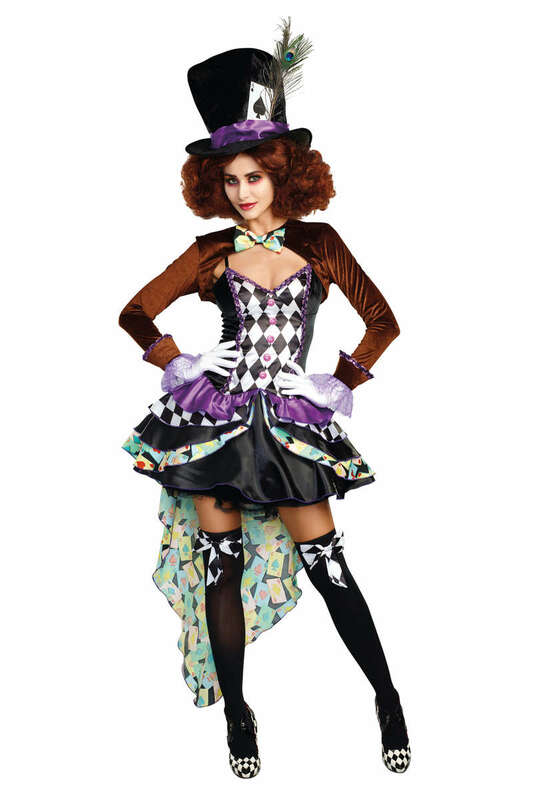 Show off your eccentric side in this Mad Hatter inspired Halloween costume, from Dreamgirl. Featuring a quirky, corset styled dress with printed satin layered high-low skirt, stretch velvet shrug with printed bow tie, and diamond printed stocking topper bow pins. Also includes the over-sized velvet top hat with card and peacock feather. You'll really be able to get into the theme in this unofficial Alice in Wonderland inspired outfit. The gloves, petticoat, and thigh highs are not included. To properly care fo your Hatter Madness Women's Costume, the designer highly recommends that you hand wash cold separately from other garments. This item is proudly designed and manufactured by Dreamgirl. There are no reviews yet for Hatter Madness Women's Costume. You can be the first to write one!